Marked by love! Paradise Galleries’ Sweet Kisses doll is a tribute to a grandmother’s unconditional love. Valentine’s Day is one of those holidays that either elicits hugs and kisses, or slammed doors and sullen silence. Yes, if your special partner remembers this special day that acknowledges fairy-tale romance, then all is good. If he or she suffers from temporary love amnesia, I pity the poor fool! Yes, forgetting Valentine’s Day is a big no-no. Interestingly, over the past two decades, the pageantry of the day has expanded beyond husbands, wives, boyfriends, girlfriends, and all other pairings blessed by Cupid. Valentine’s Day has broadened to include love for all members of one’s family. It’s a way to ensure that if your hubby doesn’t purchase a dozen roses, then at least you get the joy of bestowing a big box of chocolate upon your grandchildren. Paradise Galleries is smart enough to recognize that ever-evolving inclusion of who and what the big day covers. Meet Sweet Kisses, their latest Valentine’s creation! From head to toe, Paradise Galleries’ Sweet Kisses doll is the perfect gift for grandmas everywhere, every day! Designed by Fiorenza Biancheri, and made of the oh-so-soft GentleTouch Vinyl, Sweet Kisses is Valentine’s joy personified. Rather than focusing on the courtly love of newly engaged lovebirds, Paradise Galleries’ Sweet Kisses wisely honors the bond between grandmother and granddaughter. It is quite true that the connection between a grandparent and a grandchild is like no other. It’s often been said that parenting is all about disciplining, mentoring, worrying, and then worrying some more. Grandparenting is the equivalent of a win-win scenario. Grandma and Grandpa are allowed to indulge their grandchildren’s best behavior (and sometimes the worst tantrums, too). They get to sing songs, play games, and — all in all — have a jolly holiday worthy of Mary Poppins! Just look at that face! Grandmas will want to hug and kiss the baby’s adorable face. Paradise Galleries’ Sweet Kisses is a Valentine’s delight. The new doll from Paradise Galleries is a celebration of this unbreakable family tie. What makes Sweet Kisses so revolutionary is its UV color-changing kisses. Yes, this doll proudly shows off her love by having kisses magically appear on her skin. Little girls are often deemed the “sunshine” of a grandparent’s life. Here, Paradise Galleries’ Sweet Kisses physically changes when placed in sunlight. Once the doll is exposed to sunlight, lipstick kiss shapes appear on her face and on her left foot. When Sweet Kisses is placed under a black light, the deep-berry imprints pop up as well. Paradise Galleries’ YouTube video is extraordinary! Ready to be loved! Whether it’s a Valentine’s gift or a birthday present, this doll is irresistible. Paradise Galleries’ Sweet Kisses demands to be cuddled. It’s a fun innovation, and this doll is a fantastic way for a grandparent to keep the positive feelings of Valentine’s Day swirling around at all times. Launched in time for Cupid’s arrival, Sweet Kisses is a great gift for a son or daughter to buy for their parent. (And at $99, it won’t break the bank!) If there is a newborn or a young grandchild in the family, this is an ideal Valentine’s token for grandma. In fact, the beauty of this doll extends way beyond February 14. Paradise Galleries’ Sweet Kisses is a perennial mirth-maker. It’s impossible to look at her and not break out into a huge smile. The clothing is spot-on perfect. The outfit looks so realistic! Paradise Galleries’ Sweet Kisses is all about lifelike love and affection. Her clothing resembles the outfits that real-live babies wear. It’s not too frilly; it’s not too opulent; it’s just right! The doll’s romper is mint green, and it boasts a very pretty pink sequin heart appliqué. Her lovely light brown hair is topped with a headband that mirrors the romper’s color scheme. Because all babies are prone to make a mess at feeding time, Sweet Kisses comes with a detachable bib. 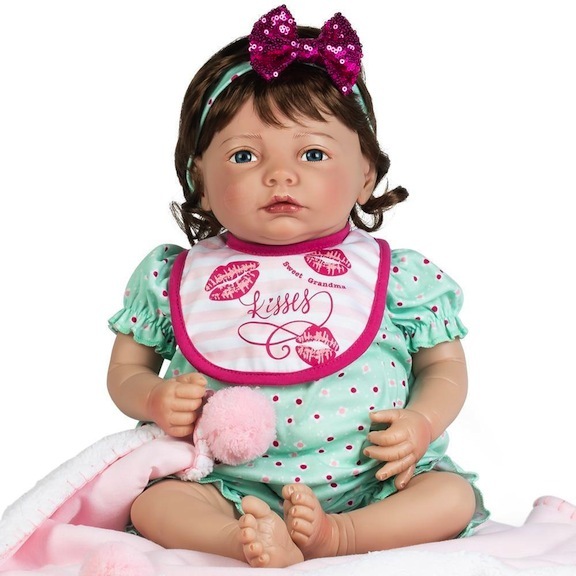 The bib drives home what this doll is all about — it proudly boasts: “Sweet Grandma Kisses.” Indeed, Paradise Galleries’ Sweet Kisses is a tribute to a grandmother’s selfless adoration of the babies that arrive in her life. A grandmother’s heart is an ever-expanding organ. It can open to love and embrace all the grandchildren that enter into her family’s circle. Sunlight on my shoulder, and on my left foot, too! The berry kiss marks pop up on the Sweet Kisses left foot! It’s so sweet! Beyond the excellent costuming, Paradise Galleries’ Sweet Kisses is defined by her warm, cuddly blanket. A two-sided knit Sherpa blanket with pom-poms is the final accent to the doll’s realistic accessories. 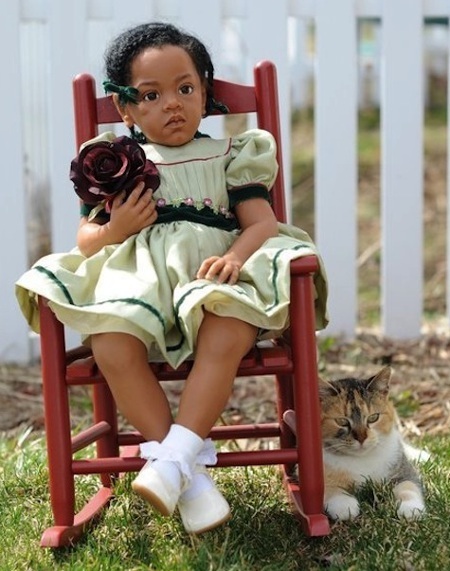 Everything about the doll is lifelike and loving. Paradise Galleries spreads the love 365 days a year, and this Valentine’s Day treat is extra sweet and extra special. The doll lives up to her name: Sweet Kisses is sweetness personified. 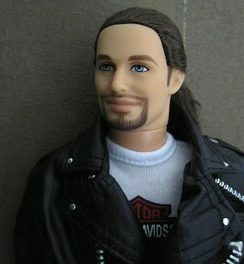 Leaders of the Pack: Dolls are easy riders and easy on the eyes!